A police officer watches the crowd at a pro-Trump free speech rally in Portland, Oregon, Sunday, June 4, 2017. Todd Kelsay, left, assisted federal law enforcement officers in restraining and handcuffing an antifa protester outside of a pro-Trump free speech rally in Portland on Sunday, June 4, 2017. Kelsay’s involvement in the arrest has sparked an investigation by the U.S. Attorney’s Office. Whether or not the mayor’s plea will have an effect remains to be seen. 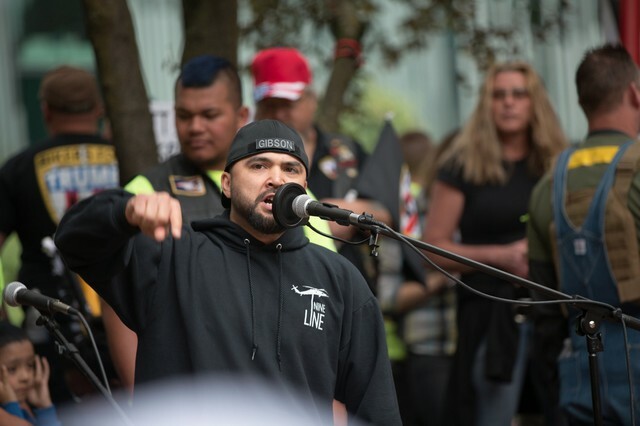 Patriot Prayer leader Joey Gibson, who lives in Vancouver, Washington, has taken to social media in the days leading up to Sunday’s rally to call for non-violence. He has said he sees it as a way to draw liberals and moderates to Patriot Prayer’s cause. Gibson has also portrayed himself and his followers as victims of left-wing violence after the fights in Berkeley. “I am beginning to realize that a lot of people don’t understand the philosophy of non-violent resistance. I just assumed most people understood the revolutionary history behind it. Jesus and MLK jr.,” Gibson wrote to his group Aug. 30. For their part, Rose City Antifa has said it is also ready to fight on Portland’s streets. “Many leftists have taken up arms throughout history against fascism and tyranny,” the group wrote in a Sept. 6 Facebook post. Rose City Antifa also criticized the mainstream media, which widely portrayed far-left groups as the instigators of violence at the most recent Berkeley rallies. 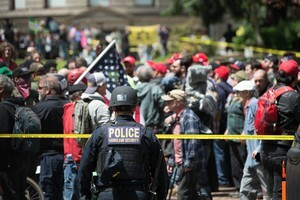 Past rallies in Portland have drawn a significant number of people, with the number of left supporters significantly outnumbering far-right demonstrators. But Sunday’s social media reservations for each group appear to be down compared to past events, with only a few hundred people from each group saying they plan to attend.